You'll be £12.00 closer to your next £10.00 credit when you purchase Fighters Under Construction in World War Two. What's this? Order within the next 8 hours, 41 minutes to get your order processed the next working day! This is another interesting collection of photos in the Images of War series from Pen and Sword. It is split into some 20 sections. Each one talking about a different subject, and illustrated with period photos which provide a fascinating insight into how aircraft were mass produced in the UK during WW2. I can't remember seeing such an extensive collection of photos, all very well explained and put into context, all together before. The opening sections deal with the Spitfire, and pictures illustrate the large production lines, along with a separate look at an experimental fuselage that was built and tested using an experimental artificial material. It was a success but as metal remained in good supply there wasn't a need to put it into production. Then there is the conversion work done on the fighter to create a folding wing for the naval Seafire variants. The rest of the subjects go on to tackle an interesting variety of topics, such as the building and testing of engines with Rolls Royce as well as Napier with their Sabre. Production lines for Hurricanes, Beaufighters, the wooden Mosquito and later the Hornet, along with the Miles Master, a trainer for fighter pilots and even the Walrus amphibian. Sprinkled in with this are pieces on the use of labour, and the increasing role of ladies in the production lines, of creating pre-assembled wiring harnesses for the electrical systems, making propellers (both metal and wood) and the manufacture of the 20mm Hispano cannon. The informative text added to some fascinating photos make this particularly interesting. One item that is especially interesting is the use of a large industrial Pantograph to cut metal parts. By tracing the new parts as they are cut using a set of original parts as a jig enabled machines to operate continuously, cutting parts that were always identical and so speeding up production. A handy reminder of how ingenious the aerospace industry had to be in wartime to gear up production, and all 40+ years before a computer had even been invented. The pantograph was the nearest thing we got to automation. Some really fascinating details to be found in here. The best entry in the Images of War series. A super book with a fascinating collection of unusual pictures. A great value to anyone with an interest in wartime aviation. Another great release from Pen and Sword in their Images of War series. The book is well written with lots of black and white pictures. Everyone who is interested in how planes were build during WWII will love this release. 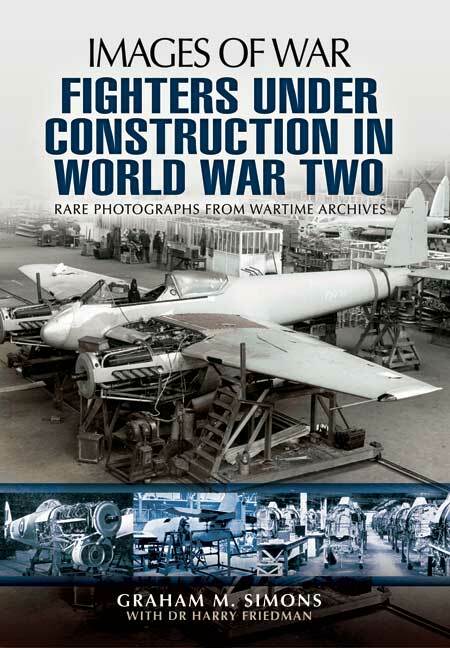 Fighters Under Construction in World War Two by Graham Simons, "Rare and unpublished photographs show numerous aircraft of the Royal Air Force as they have scarcely been seen before; divided into their component parts on a production line. Chapters cover the Spitfire, Seafire, Hurricane, Mosquito, Hornet, Typhoon, Tempest, Beaufighter, Walrus and Aircobra, as well as the production of propellers, the Merlin engine and 20mm Hispano cannon. The photographs alone give a vivid sense of the production stages of each, showing the numerous phases by which the airframe was fashioned by expert craftsmen, long before the days of modern robotic assembly. Extensive notes accompany each photograph and they give a real insight into the manufacturing process as well as a brief overview and service history of the aircraft. For those enthusiasts who enjoy Second World War aviation history this title provides a look at the development and manufacture of the aircraft that ultimately won the air war for the allies. All the photographs are black and white and consist of planes is varying forms of construction. The iconic Spitfire, Hurricane, Typhoon, Bristol Beaufighter and De Havilland Mosquito are all here as well as others. Author Graham Simons had previously produced "B-17 Memphis Belle" so is no stranger to the Images of War format. His text is concise and descriptive but although he provided a very handy "Selected Technical Glossary" at the front of the book I felt that you needed to have at least a reasonable degree of knowledge of these WW2 aircraft to fully appreciate his explanations. The book gives credit to the somewhat unsung heroes who worked on these production lines as well as the designers and that can only be a good thing. The pilots that risked their lives on a daily basis and in far too many cases paid the ultimate price for their bravery have always quite rightly been the subject of books and film so it is nice to see publications like this that acknowledge those that carried out the more mundane but equally important work under intense deadlines. A great addition to the bookshelf of the devout World War II aviation enthusiast.